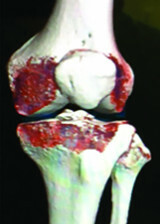 Tibial spine fracture is an uncommon injury that accounts for 14% of traumas to the anterior cruciate ligament (ACL). It is seen as often in children and adolescents as it is in adults. Tibial spine fracture is an uncommon injury that accounts for 14% of traumas to the anterior cruciate ligament (ACL) (1). It is seen as often in children and adolescents as it is in adults. It occurs most often in menopausal women and growing children (1–7). The mechanism that is most often cited is a forced hyperextension of the knee with simultaneous rotation (2,8). The main causes are found to be traumas due to sport, falls or road traffic accidents (2,4,5,7–10).